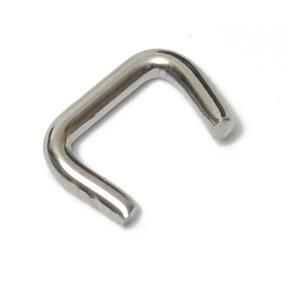 7/32" to 1/4" Stainless Steel Hog Rings are used to secure a hook to the end of a 1/4" bungee cord. Much more reliable than trying a knot. 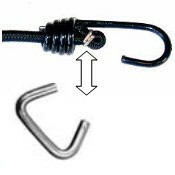 Slide the hook over the end of the shock cord, fold the end of the shock cord over and clamp the hog ring with Hog Ring Pliers or vice grips to the folded end. Dull ends w/overlapping legs. Sold per package of 10.